ITS Central is an application designed to integrate with a large number of open data sources, data from customers’ existing systems, and hardware and video sources. It provides customers with an unmatched level of situational awareness that is needed in control room environments, especially during significant events such as major accidents, snow/ice storms, or other emergencies. ITS Central’s user interface is fully browser-based. It does not require any special software installed on the user’s computer other than a modern, up-to-date browser such as Chrome, Firefox, Safari, or Internet Explorer (version 9 and above). The software can also be accessed by most browsers on mobile phones and tablets, including iPads and Nexus tablets. ITS Central works on anything from tiny 5” phone screens and 7-10” tablet screen, to large desktop monitors and display walls. Moreover, ITS Central does not require Java, Flash, or Silverlight to operate. Since ITS Central is browser-based and not Internet Explorer specific, users can access ITS Central from machines running virtually any operating system. No need for IT administrator when deploying in client computers. Access ITS Central anywhere in the corporate Intranet. Access ITS Central remotely (e.g., from home or on the road) using standard corporate remote access mechanism. Access ITS Central using mobile devices such as smart phones and tablets via standard corporate remote access mechanism. When ITS Central is updated, there is no need to update the client software in every client computer. An up-to-date browser is all you need. The ITS Central map display provides a comprehensive overview of the state of the roads. 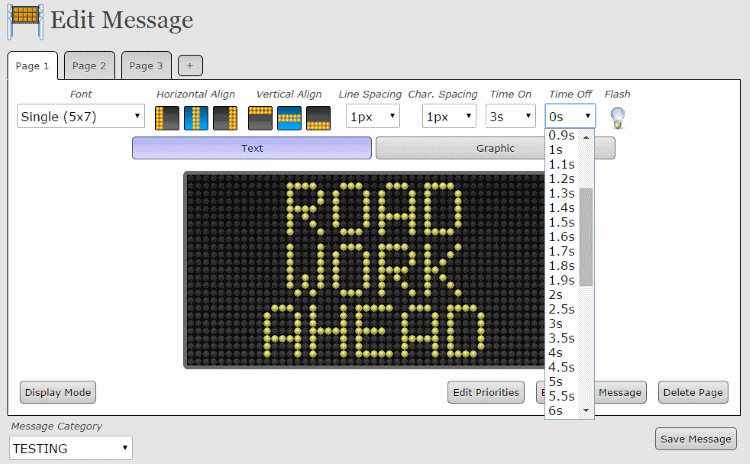 Performance – ITS Central has a high-performance map overlay engine that allows thousands of icons and colour-coded road speed tiles to be displayed simultaneously. It works very well for ultra-high resolution screens, such as display walls. Robust Search Capabilities – Search for any issue or piece of equipment quickly and efficiently. Historical View – Dial the clock back to any point in time to see the historical state of traffic, issues, and camera images. 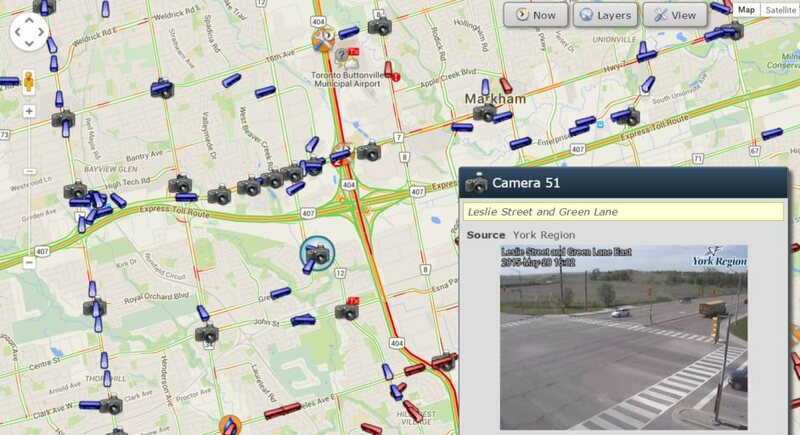 The map display showing traffic cameras, road work and both YRT and TTC buses near 404 / 407. Both the Open Street Map and WMS platforms allow the use of ITS Central without internet access. This makes them suitable for emergency situations where Internet connectivity may not be reliable. Construction, Road Work and Accidents – Published by municipal and provincial governments. Traffic Camera Images – Published by the municipal and provincial governments. Transit Vehicle Locations – Published by multiple transit agencies. Weather Stations – Weather readings from Environment Canada and the US National Weather Service. A badge from the map display showing weather data collected from a weather station. ITS Central allows users to create “Travel Time Path” – essentially an arbitrary path on the road where link-by-link traffic data will be aggregated into travel time data. Once travel time path is created, its travel time along with queue location and queue lengths are calculated every time the system receives an update of traffic data . 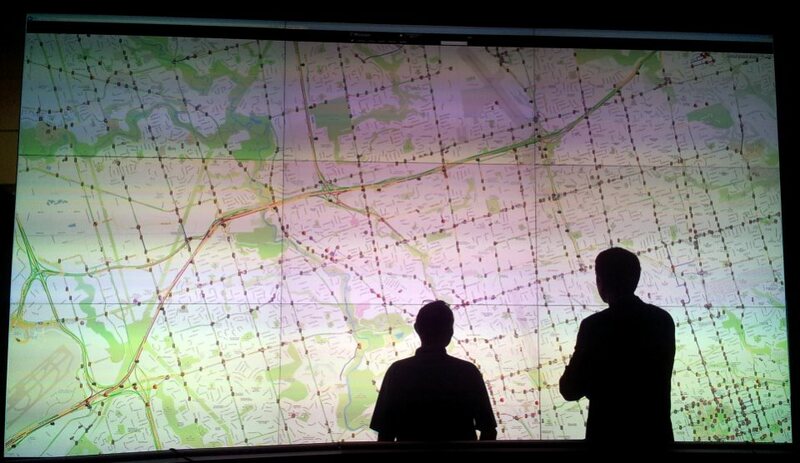 The travel time can then be plotted and downloaded for future analysis. Queue warning messages (e.g., TRAFFIC QUEUE 1KM AHEAD). ITS Central is fully compliant with NTCIP and has been tested on Ver-mac PCMS 1500. ITS Central has also been used extensively on signs manufactured by ADDCO, SolarTech, Daktronics, LedStar, and Precision Solar Control. Transnomis Solutions guarantees support to all NTCIP-based signs, even though different manufacturers have their own “flavour” of NTCIP. ITS Central has an intuitive “what-you-see-is-what-you-get” interface for message editing. The number of phases may be limited to four by simple configuration. The on/off timings of the message phases are programmable. ITS Central tracks the history of messages displayed through the software as well as those posted outside of the system. The dashboard further enhances the situational awareness of staff by providing key summary information. The dashboard may include a tour of various graphs of travel times computed by ITS Central, as well as the number and type of ongoing traffic incidents with nearby cameras and fleet vehicles highlighted. Transnomis staff will customize the dashboard based on the customer’s needs. Please see below two sample dashboards designed for the Ministry of Transportation Ontario. 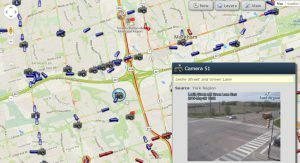 Sample dashboard showing travel times, latest issues, map, weather, Ontario Provincial Police Twitter feed and traffic cameras nearest to the latest traffic incidents. Interactions with ITS Central are logged and can be reviewed at any time by administrative staff. Logged actions include posting a message on a sign, adding or editing an issue, viewing a camera video stream, and viewing the information page for any piece of equipment. ITS Central employs a flexible group-based user permission model. The permissions are fine-grained so that access can be customized to the organizational structure and business processes of the customer.